While Shane roofed a house yesterday for a friend of ours, my mom and I took the boys over to Champaign to do some shopping. I had to go to Sam's (ugh) for some necessities, and we decided to take the boys to the mall, too. We had a really good time together, as always. 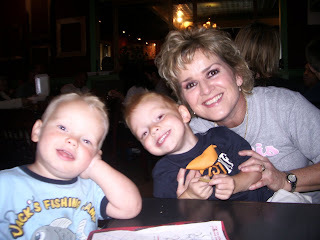 Mom is so good with the boys--really patient (where I lack sometimes, especially if they aren't acting the greatest) and super helpful. You would never know that she only raised one daughter by the way she handles my three like it is nothing! 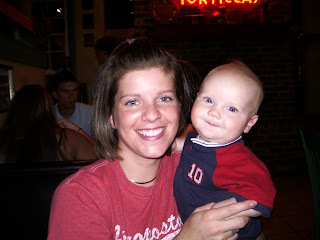 We decided on a Mexican place for lunch, since Colin was requesting a taco. :-) The boys ate great and Ethan was really good which made the restaurant experience much more enjoyable. Then we headed to the mall and did some more shopping. I had intended on looking for some shirts for myself, but who am I kidding? I haven't REALLY shopped for myself in like, oh, 4 years of so? I just can't help it. Even if I do go looking for myself, I always end up in The Children's Place or Baby Gap, or the children's department of some other store! Why is that? Well....I know why, I guess.....because I can't really help myself, always on the lookout for deals for them and everything! But, the main reason is that everytime I do find something for myself, and actually make it to the dressing room to try it on, I am always depressed at my reflection and then turned off to shopping for myself the rest of the day. 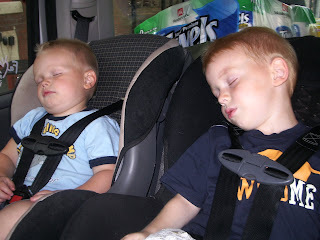 (If I could just lose that last 5 pounds from Ethan.....and the last 5 from Cameron....) By the time we were done--a good 5 hours or so after we started--the boys were pooped.....it wasn't 5 minutes into the car ride home and this is what we saw in the back seat! Thanks mom (and my sweet boys) for another great day! fourth--i totally agree with you on getting clothes for ourselves, happens rarely these days....kids clothes are much more important and fun these days!! :) lol. hey dev. alright LISTEN! That is enough of the negativity talk about how you look! (I have those same days don't worry)There is a bit of a problem though. I feel I look better pregnant and in those clothes than when I am smaller and not pregnant at all. Talk about sad. oh and don't feel bad about keeping on those "last five lbs" Tricia and I talk about that all the time and it is as if your body keeps that on while you are nursing so your body can produce enough. That really helped me. k have a great day!